Once your Legacy Life Membership begins, an annual endowment in your name will be made to your Post, Department and the organization. You will feel confident knowing your contributions to our organization are not only helping today’s veterans, but the veterans of tomorrow. Future generations will know and remember you for the sacrifices you made during your time in uniform in addition to the contributions you made as a VFW Legacy Life Member. 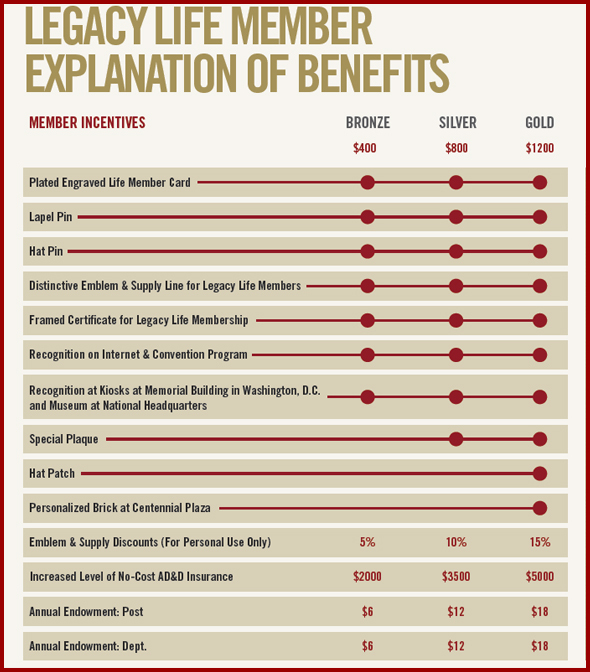 Three prestigious levels of Legacy Life Membership are available (Gold, Silver or Bronze). Each level offers generous benefits reserved exclusively for Legacy Life Members.